The global supplier of reliable energy systems — Bosch Industriekessel, has been cooperating with us for decades. This time Bosch supplied us with two 2.5-MW boilers for a modular boiler room for heating and hot water supply for the complex of buildings of the clinical hospital. In the beginning of November, the production of this boiler house will be completed, and commissioning is scheduled for the second half of November. Scientists have developed a new low-temperature catalyst for producing high-purity hydrogen gas while simultaneously using up carbon monoxide (CO). The discovery could improve the performance of fuel cells that run on hydrogen fuel but can be poisoned by CO.
Scientists have developed a new low-temperature catalyst for producing high-purity hydrogen gas while simultaneously using up carbon monoxide (CO). The discovery — described in a paper set to publish online in the journal Science on June 22, 2017 — could improve the performance of fuel cells that run on hydrogen fuel but can be poisoned by CO.
«This catalyst produces a purer form of hydrogen to feed into the fuel cell,» said José Rodriguez, a chemist at the U.S. Department of Energy’s (DOE) Brookhaven National Laboratory. Rodriguez and colleagues in Brookhaven’s Chemistry Division-Ping Liu and Wenqian Xu-were among the team of scientists who helped to characterize the structural and mechanistic details of the catalyst, which was synthesized and tested by collaborators at Peking University in an effort led by Chemistry Professor Ding Ma. Because the catalyst operates at low temperature and low pressure to convert water (H2O) and carbon monoxide (CO) to hydrogen gas (H2) and carbon dioxide (CO2), it could also lower the cost of running this so-called «water gas shift» reaction. «With low temperature and pressure, the energy consumption will be lower and the experimental setup will be less expensive and easier to use in small settings, like fuel cells for cars,» Rodriguez said. «We modeled different interfaces of gold and molybdenum carbide and studied the reaction mechanism to identify exactly where the reactions take place-the active sites where atoms are binding, and how bonds are breaking and reforming,» she said. U.S. electricity power producers have reduced carbon dioxide emissions by 24 percent since 2005, according to a new report from Carnegie Mellon University’s Scott Institute for Energy Innovation. The new index estimated that emissions from the American power generation sector totaled about 1,001 pounds of CO2 per MWh in 2016’s fourth quarter. Short-term, it was surprisingly a 1 percent increase over the same period of the previous year—possibly due to a slight coal comeback—but nearly a quarter lower than in 2005, when emissions averaged 1,324 pounds of CO2 per MWh. «The Carnegie Mellon Power Sector Carbon Index highlights what is taking place in the industry as older, inefficient coal-fired power plants have been replaced with renewables and highly efficient natural gas power plants,» said Paul Browning, CEO of Mitsubishi Hitachi Power Systems Americas, which sponsors the index. «Power generators are making significant strides in reducing carbon dioxide and other emissions, while at the same time meeting growing demands for affordable and reliable electricity. The Carnegie Mellon Power Sector Carbon Index will measure the environmental impact of the U.S. power grid by evaluating both on an annualized basis and dating back to 1990, according to the release. The report found that more than half of the reduction in Co2 emissions since 2005 occurred because of the industry shift from coal to natural gas-fired generation. Natural gas emits only about half of the carbon that coal does, and the emissions intensity of the gas fleet itself has fallen by 17 percent since 2001 thanks to greater turbine efficiency and operating schedules. Coal, however, mounted a bit of a rally in 2016, according to the results of the report. Coal generation was up by 12 percent in the fourth quarter, or 305 million MWh, compared to 2015’s final quarter total of 273 million MWh. But the carbon intensity was down 2 percent over the same period, the same reduction that the U.S. gas-fired fleet achieved, the index reported. Renewable electricity generation rose 7 percent in 2016’s fourth quarter to 154 million MWh and represented 16 percent of the national generation mix in that stretch. Nuclear electricity generation also was 4 percent higher than in 2015’s last three months. Natural gas generation, credited as the reason behind carbon reductions, was down 9 percent in 2016 to 294 million MWh, compared to 322 million MWh in the fourth quarter of the previous year. This post is a synopsis of Energy Innovation’s issue brief describing the research and findings from its latest study, “Natural Gas versus Coal: Is Natural Gas Batter for the Climate?,” which has been published in Electricity Journal. New research, led by Energy Innovation’s Director of Research Chris Busch, compares the climate impacts associated with electricity generated from natural gas versus coal. The findings conclude that, even under the best of circumstances, electricity generated by natural gas-fired power plants can only make a modest dent in abating climate change—and, if developed poorly, with serious methane leaks, or if used to displace energy efficiency or renewable energy, natural gas could instead seriously contribute to the problem. Natural gas is made up of mostly methane, which can be emitted through intentional venting or accidental leakage at all stages of the natural gas system, from extraction to processing, transmission, distribution, and end-use. Methane is a powerful greenhouse gas (GHG); it causes 28 times more global warming than carbon dioxide on a mass basis over a 100-year period. On a 20-year basis, the impact of methane is 84 times larger than carbon dioxide, and its impact is 120 times larger when first released. Energy Innovation’s analytical framework estimates the GHG emissions caused by generating one megawatt-hour (MWh) of electricity from both coal and natural gas power plants, taking into account their three largest sources of emissions: methane, smokestack carbon dioxide (emitted from fuel combustion at the power plant), and upstream carbon dioxide (emitted during production and transmission of fuel prior to reaching the power plant). A power plant’s efficiency significantly drives its GHG intensity, which can vary widely across new, existing, and retired (coal) power plants. Recent research (Brandt et al. 2014) has increased certainty about the rate of methane emissions from the natural gas system, indicating it is roughly in the range of two to four percent for the United States on average. “New” represents the efficiency for typical power plants constructed today. “Average” is the average plant efficiency of all plants operating in 2012. “Retired coal” is the average efficiency for coal plants that have recently shut down. The methane leakage rate is shown in parenthesis for each gas scenario. These results illustrate natural gas’ advantage over coal in smokestack emissions, yet methane emissions diminish this gain. When comparing first-year impacts, both new and average gas plants with high methane leakage rates would be more GHG intensive than new or average coal plants. After 20 years, one MWh from new gas is 16–40 percent less GHG intensive than average coal, depending the level of methane emissions. After 100 years, the advantage of natural gas increases; it offers an improvement of 44–52 percent above coal. Yet, by this time, emissions reductions must be much more ambitious than this if we are to power civilization in a way that enables a safe and stable climate. So while it may be beneficial to use existing natural gas capacity to help shut down existing coal plants, investment in many more natural gas plants in the future may not be advisable, especially if they replace (rather than enable) increased electricity generation from renewables. This article was originally posted on Energy Innovation’s blog page. A new natural gas power plant in Russia will be powered by Wartsila technology. The 110 MW unit will be by the largest power plant in Russia powered by Wartsila, according to the company. The gas plant will provide electric power for large industrial consumers, while meeting the highly variable load requirements with flexibility and fast starting capability. The plant will be connected to the power grid, although the primary purpose of the project is to provide a reliable and efficient electricity supply for local industrial consumers. The order was placed in April 2013 by Transmashenergo, an independent power producer, and the power plant is to be located in Tikhvin in Russia’s Leningrad region. It will use six Wartsila 50SG engines. Wartsila will supply the engineering, the generating sets with auxiliary modules and systems, automation and control equipment, the electrical system, and the engine hall complete with stacks fitted with carbon monoxide control catalysts. Wartsila will also provide installation and commissioning assistance, and training. 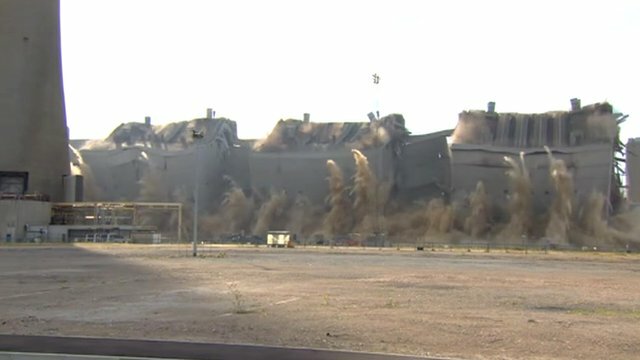 Five buildings on the Kingsnorth Power Station site on the Hoo peninsular in Kent were demolished in October 2014. The power station was forced to cease production in 2013 after failing to meet EU standards on emissions. About 15 million wood-fired stoves and combustion systems exist in Germany, including central-heating boilers for apartment houses. They are subject to strict clean air regulations. New wood-fired boilers exceeding emission limits for particles have to be equipped with precipitators since the beginning of 2015. Next week, scientists will present the Carola®-precipitator for boilers. The Carola®-precipitator (light green) is installed into the flue gas passage reduces the concentration of soot and fine dust by up to 90%. «All wood-fired boilers can be equipped with our compact, low-maintenance precipitator,» Dr. Hanns-Rudolf Paur, one of the inventors and scientist of Karlsruhe Institute of Technology (KIT), says. The Carola®-precipitator is installed into the flue gas passage between the boiler and the stack and reduces the concentration of soot and fine dust by up to 90%. If necessary, several systems can be connected in parallel or in series. The CCA system was developed to maturity for boiler systems of 25 to 1000 kW in cooperation with boiler manufacturers. The functioning principle of the patented Carola®-precipitator is rather simple: The precipitator consists of two chambers. In the ionization chamber the particles of the flue gas are electrically charged by corona discharge. A natural corona discharge can be observed on e.g. masts of ships during thunderstorms. In the downstream collector chamber of the CCA system the charged soot and dust particles are deposited on a helical brush. It rotates regularly over a scraper and the collected particles fall into the collection vessel. «The only maintenance work to be done by the user is to empty the vessel every few months,» Paur explains. «The advantages of our precipitator over other principles are obvious,» Dr. Hans P. Rheinheimer, Managing Director of CCA GmbH, a startup of KIT, says. The system is nearly maintenance-free, can be integrated into the boiler, and consumes less energy than a bulb. Contrary to HEPA filters, it is not necessary to exchange wear parts and the cross section of the stack is hardly reduced. With a separation efficiency of up to 90%, modern boilers can comply with the limits given by the Federal Emission Control Ordinance (1. BImSchV) for 2015. Scientists are working on a heat engine that consists of just a single ion. Such a nano-heat engine could be far more efficient than, for example, a car engine or a coal-fired power plant. As the physicists explain in an article recently published in the journalPhysical Review Letters, the efficiency of heat engines powered by thermal heat reservoirs is determined by the second law of thermodynamics, one of the fundamental concepts in physics. It was as far back as 1824 that Frenchman Nicolas Carnot calculated the maximum possible efficiency limit of such engines, now known as the Carnot limit. In the case of the newly proposed nano-heat engine, the scientists have been theoretically able to exceed the classic Carnot limit by manipulating the heat baths and exploiting nonequlibrium states. Calculations and simulations made about a year ago showed for the first time that the thermo-dynamic flow in an internal combustion engine could be reproduced using individual ions. The idea was to use a calcium 40 ion, which has a diameter a million times smaller than that of a human hair, for this purpose. «Individual ions can basically act as the piston and drive shaft or, in other words, represent the entire engine,» explained Johannes Roßnagel of the Quantum, Atomic, and Neutron Physics (QUANTUM) work group of the JGU Institute of Physics. Individual ions have already been captured in Paul traps and, using laser beams and electrical fields, not only cooled and heated but also compressed. «This means we are able to manipulate the pulse location distribution for optimum efficiency,» added Roßnagel. «Exceeding the Carnot limit for a standard heat engine thus does not violate the second law of thermodynamics but instead demonstrates that the use of specially prepared, non-thermal heat reservoirs also makes it possible to further improve efficiency.» In their publication, the physicists calculated the general Carnot limit for this situation. As the mechanical capacity of a single ion machine is extremely low, it can probably only be used in heating or cooling nano systems. A debate has raged in the past couple of years as to whether natural gas is better or worse overall than coal and oil from a global warming perspective. The back-and-forth findings have been due to the timelines taken into consideration, the details of natural gas extraction, and the electricity-generating efficiency of various fuels. A new analysis which focuses exclusively on potential warming and ignores secondary considerations, such as economic, political, or other environmental concerns, finds that natural gas is better for electricity generation than coal and oil under all realistic circumstances. A debate has raged in the past couple of years as to whether natural gas is better or worse overall than coal and oil from a global warming perspective. The back-and-forth findings have been due to the timelines taken into consideration, the details of natural gas extraction, and the electricity-generating efficiency of various fuels. An analysis by Cathles, which focuses exclusively on potential warming and ignores secondary considerations, such as economic, political, or other environmental concerns, finds that natural gas is better for electricity generation than coal and oil under all realistic circumstances. (3) a low-carbon scenario, where all electricity generation is immediately and aggressively switched to non-fossil fuel sources such as solar, wind, and nuclear. The author finds that the gas substitution scenario would realize 40 percent of the reduction in global warming that could be achieved with a full switch to low-carbon fuel sources. The benefit for mitigating warming revolves around the fact that to produce an equivalent amount of electricity burning natural gas would release less carbon dioxide than burning oil or coal. Though atmospheric methane traps more outgoing radiation than carbon dioxide does, at reasonable leakage rates its atmospheric concentration is much lower and what is released decomposes much more quickly. The author suggests that over timescales relevant to large-scale warming — decades to centuries — the effect of any methane released during natural gas extraction would be inconsequential.